Hi friends! I’m back with a new layout for Hip Kit Club using the November 2016 Kits and the Documenting December Kit. This week’s layout is based off the HKC Facebook Member Forum Sketch #3. I started by cutting two filmstrips, from a couple Cricut carts that I have in my stash, on two Crate Paper-Snow and Cocoa pattern papers from the Main Kit. For added detail I tucked in a few snowflakes (2 are from an Exclusive HKC Cut File & the other is from the Crate Paper-Snow and Cocoa ephemera pack included in the December Documented Kit). I used the American Crafts Fountain Cardstock from the Cardstock Kit and yet another pattern paper from the Crate Paper -Snow and Cocoa Collection for the layers behind my photo. The Snow and Cocoa Collection is so beautiful!! I think I could use this collection for all my wintery/Christmas themed layouts forever! Once I knew where I wanted the layers to sit I grabbed the Well Blue Me Down Shimmerz Mist that is included in the Color Kit and applied a watercolor background using the packaging technique. I wanted to add a bit more mixed media so I used the Foiled Again Dazzlerz Texture Paste and the Echo Park stencil that is also included in the Color Kit to make a few horizontal lines above and below the photo. Next I moved onto adding a cluster towards the bottom left hand side of the layout. I grabbed a couple ephemera pieces from the HKC exclusive ‘Tis the Season ephemera pack, included in the Main Kit, and another snowflake cut from the same HKC exclusive cut file. Have I mentioned before that there are free cut files on HKC’s website? 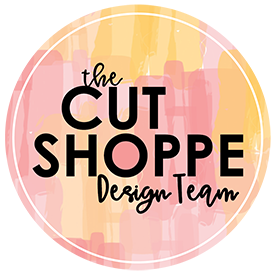 Yep, free cut files, even for those who are not subscribers to the kits! AND…there is currently a 12 Days of Giving celebration happening where a free cut file is released each night December 1-12, 2016. You have to be registered on the HKC website in order to have access to the freebie cut files and it’s a simple process. Just enter your email address and you are good to go! Once I had the cluster arranged I wanted to add a couple pops of color along the left hand side of the layout. So I cut one of the manufacturing strips from an exclusive pattern paper included in the December Documented Kit and added another pop of color using a pink polka dot pattern paper from the Crate Paper-Snow and Cocoa Collection that is included in the Main Kit. I used my scallop border punch and a teal colored pattern paper from the Snow and Cocoa Collection for a little added interest. My journaling was a bit tricky for this layout. It is a long story about the night we decided to go to a dollar theater to see a movie. The theater was cold…like cold, cold. We had to wear our winter coats the whole time! There was a musty smell and a bright yellow line running straight down the center of the screen for the entire movie. It was like we were watching the movie on two separate screens. Not to mention all the pops, flickers and cracks while the movie played. It was an absolutely terrible movie going experience but it is one of my all time favorite memories of us as a family. As the events continued to play out we laughed until I thought I would cry. It was a true you get what you pay for experience! In order to document that entire story I typed my journaling on my We R Memory Keepers Typecast Typewriter and cut it into thin strips. I then positioned the strips on the right & left side of the photo. This allowed me to tell the whole story without having to run the journaling down the entire length of the page. It kept is concise and doesn’t distract from the photo, the embellishing or the mixed media. For final touches I added silver metallic machine stitching and a sprinkling of sequins. Remember to head over to the HKC Facebook Forum to check out the sketch! Each week a new sketch will be revealed and you will have three interpretations from design team members. We would also love to see what you create! Remember you do not have to be a kit subscriber to join us! It’s just a fun place to chat with other papercrafting loving people!